When applying Continuous Delivery to an application estate, our ability to rapidly release individual applications is constrained by inter-application dependencies. We want to release applications independently in order to minimise batch size and cycle time, but the traditional risk reduction methods associated with inter-application dependencies compromise lead times and are fundamentally incompatible with Continuous Delivery. How can we enable the independent evolution of interdependent applications with minimal risk? For example, consider an estate initially comprised of two independently versioned applications – a Provider application that offers name/address/phone details, and a Consumer A application that uses name/address details. In this scenario, the interdependent relationship between Provider and Consumer A means an independent release of either application will increase the probability of a runtime communications failure between the applications. As Consumer A has little knowledge of the Provider a new Consumer A artifact might unintentionally alter its usage of the Provider API, and conversely as the Provider has zero knowledge of Consumer A a new Provider artifact might break API compatibility for an unchanged version of Consumer A. The fear of change and uncertainty associated with this inter-application dependency is exacerbated when another consumer with different requirements is added to the application estate, such as a Consumer B application requesting name/address/email details from the Provider. Given that all of the above methods will increase the cost of change and cause the evolutionary design of our application estate to stagnate, we need a more adaptive solution that will favour Build Quality In over Risk Management Theatre. 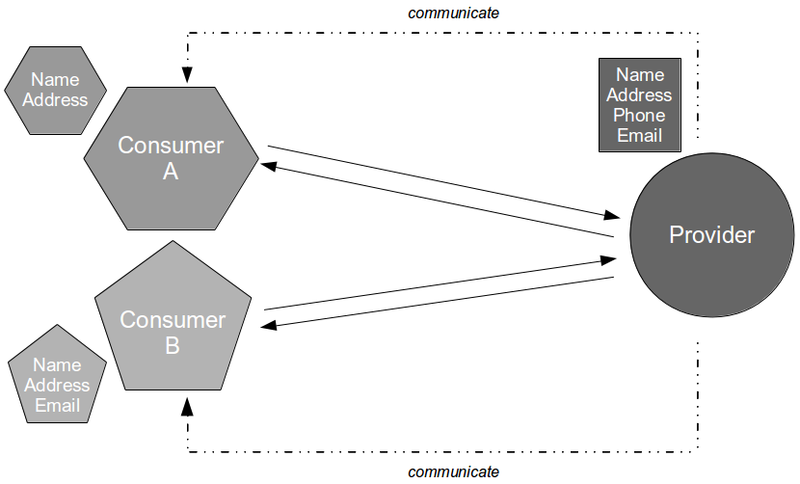 We can reduce the consumer-side risk of each inter-application dependency by implementing the Tolerant Reader and API Examples patterns within Consumer A and Consumer B, but this solution is incomplete as it cannot address the provider-side risk – a new Provider artifact could still harm unchanged versions of Consumer A and/or Consumer B running in production. With Consumer Driven Contracts, the subset of information within the Provider Contract that a consumer is actually dependent upon forms a Consumer Contract that is communicated back to the Provider at build time. It is then the responsibility of the Provider to run a suite of unit tests in its commit build against each of its Consumer Contracts to ensure that no provider change could unexpectedly cause a communications failure at run time. Consumer Driven Contracts are relatively cheap to implement, yet enormously powerful. As the Consumer Contracts supplied to the provider are executable specifications they provide an automated documentation mechanism that increases the visibility of existing inter-application relationships, and enable a testing strategy that favours the fast feedback of unit tests over the complexity and unreliability of end-to-end tests. Given that Consumer Driven Contracts enable us to visualise inter-application relationships and detect potentially harmful changes within seconds, Ian was not exaggerating when he stated that Consumer Driven Contracts “give us the fine-grained insight and rapid feedback we require to plan changes and assess their impact“. 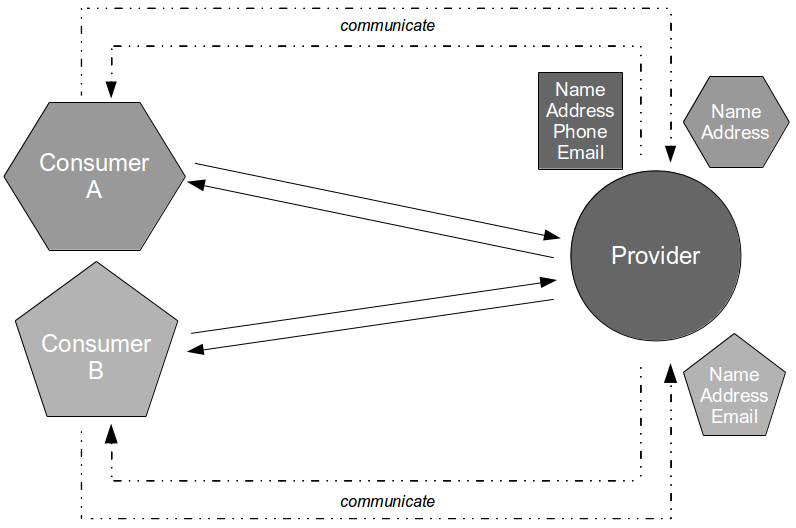 If we apply the Consumer Driven Contracts vocabulary to our earlier example, it is apparent that our Provider application is offering a name/address/phone/email Provider Contract, with Consumer A encapsulating a private name/address Consumer Contract and Consumer B encapsulating a private name/address/email Consumer Contract. These Consumer Contracts should be elevated to first class concepts and persisted within the Provider application as a Consumer Driven Contract, so that the Provider is made aware of consumer expectations and can be independently released without fear of harming any inter-application dependencies. Regardless of original intent, the Consumer Driven Contracts pattern is of immense value to Continuous Delivery and is an essential tool when we wish to independently release interdependent applications. 18 December, 2013 at 02:00. In general I would argue that it’s the responsibility of the Provider to make sure that it doesn’t break its existing behaviour. Of course, in a complex environment this can be extremely difficult to accomplish so I guess this is where Consumer Driven Contracts may thrive. You say that these Contracts are executable specifications so I guess this means that they are written by the Consumer’s dev team. Considering that this code will run inside the Provider’s build system, this would also imply a close relationship between the Consumers and the Provider, like being part of the same organization or at least sharing the same technologies. And if this close relationship already exists, isn’t it easier to just open up the Provider’s “Provider Contract” test suite to the Consumers and let them add any tests that they feel are missing? It’s the responsibility of both Provider and Consumer to protect the integrity of API conversations, but all too often Provider and Consumer know nothing of one another and costly risk reduction strategies can creep in. A Consumer can protect itself against unexpected change with relatively little effort, but protecting a Provider with multiple Consumers can be difficult and that’s where Consumer Driven Contracts come in. Increasing the visibility of existing inter-application relationships is really powerful. In an ideal world the Provider and Consumer teams will have a close relationship regardless of their organisational loyalties, and ideally a Provider will receive Consumer Contracts that are executable specifications. When this doesn’t happen, Consumer Driven Contracts remain enormously powerful even if the contracts are emails/spreadsheets etc. That is at least a starting point – the contracts should be a placeholder for a conversation whenever the Provider API needs to change.